The advent of the connected car will transform the face of the fleet industry but fleets must act now to embrace ‘big data’ and ensure they don’t fall foul of forthcoming data protection legislation. Craig McNaughton, corporate director, Lex Autolease, forecasts big data will enable leasing firms to “predict the future”. 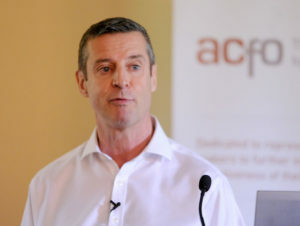 These were some of the issues covered at last week’s ACFO spring seminar, which also saw speakers outline how contract hire companies will transform into analytics businesses that lease vehicles. Held at Whittlebury Hall, Northamptonshire with an audience of around 80 decision-makers, the event saw Alex Ktorides, head of ethics and risk and a partner at law firm Gordon Dadds, tell delegates that it is crucial to make sure big data is ethically handled, in particular by updating employment contracts, terms and conditions and codes of conduct. Pointing to the 25 May 2018 introduction of the General Data Protection Regulation (GDPR) – which builds on existing data protection legislation with a particular focus on digitalisation and technology, Ktorides said fleets need to plan how they will use connected information and tell their employees. He added that penalties for breaching the core “principles” of GDPR are potentially huge, with a maximum fine for companies of €20m or 4% of total worldwide annual turnover of the preceding financial year, whichever is the higher – but also the reputational damage of businesses misusing data or losing it must not be under estimated. Delegates at the ACFO event also heard how for contract hire and leasing companies, the arrival of ‘big data’ means “transformational change”, with Craig McNaughton, corporate director, Lex Autolease, forecasting that it will enable them to “predict the future” in terms of vehicle service, maintenance and repairs and driver behaviours as a result of data analysis thus taking away fleet operation uncertainty. That journey is already starting with the piloting and ultimate roll out by Lex Autolease to clients of operational benchmarking across a raft of in-life areas of vehicle expenditure and risk to enable fleet improvements and cost savings to be made. McNaughton added that analysis of ‘big data’ will enable vehicle leasing and fleet management companies to become ‘Mystic Megs’ as they predict the future and eliminate cost and operational uncertainty for fleet customers. However, the transformation will not be without its challenges and behind the scenes policy makers, vehicle manufacturer and leasing company representative organisations are discussing numerous issues around data ownership and accessibility. ACFO seminar delegates also heard a forecast from Nick Mitchell, Audi’s service and technical manager on how cars would change from being a “status symbol” to a “mobile device”, with drivers able to download functionality that physically changes a model’s characteristics and specification with a potential huge impact in numerous areas of fleet operations as well as the likely requirement of tax and legislation revisions. For example, he highlighted that a company car could be sold as a 150bhp model, but on demand a driver could add a further 20bhp, which would completely change a model’s performance and thus its carbon dioxide (CO2) emission figure and therefore an employee’s Benefit-in-Kind tax bill. And Julien Combeau, industry services lead Europe, client risk solutions at insurance giant AIG, said fleet insurance premiums will reduce as connected cars make the roads safer. The event also saw delegates told how the fleet industry faces a ‘massive’ revolution, with big data set to overhaul the long-established fleet management model. In response the industry was urged to take charge of managing the changes, including the vital issue of security. ACFO chairman John Pryor concluded: “We are currently at the tip of an iceberg. The arrival of ‘big data’ will have a major impact on fleet operations and company car drivers.